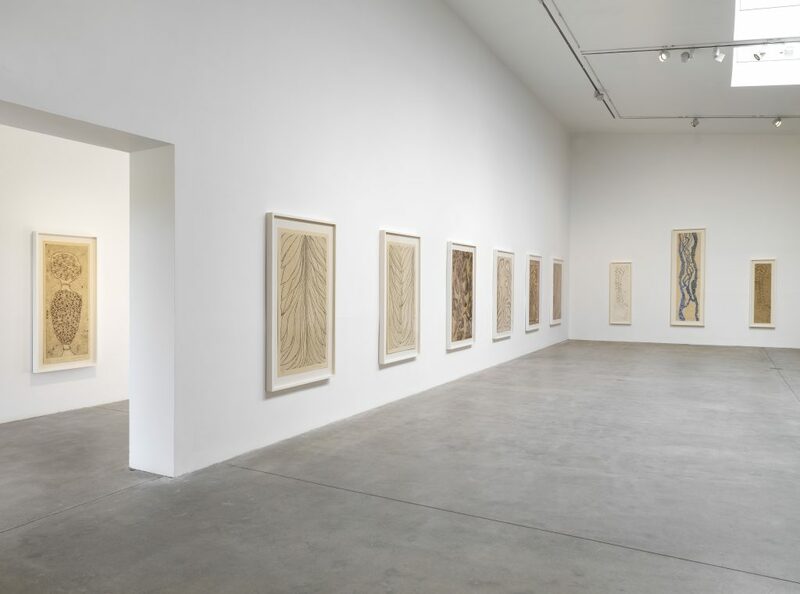 On view until 1 January 2017, Hauser & Wirth Somerset presents a solo exhibition of sculpture and works on paper by Louise Bourgeois. 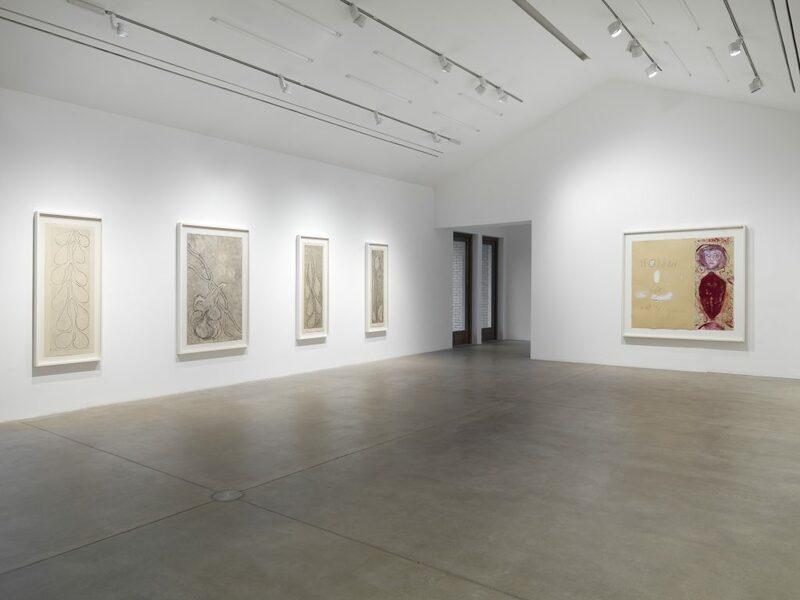 The exhibition ‘Turning Inwards’ comprises a series of 38 soft-ground etchings Bourgeois made between 2006 and 2010, shown together for the first time. 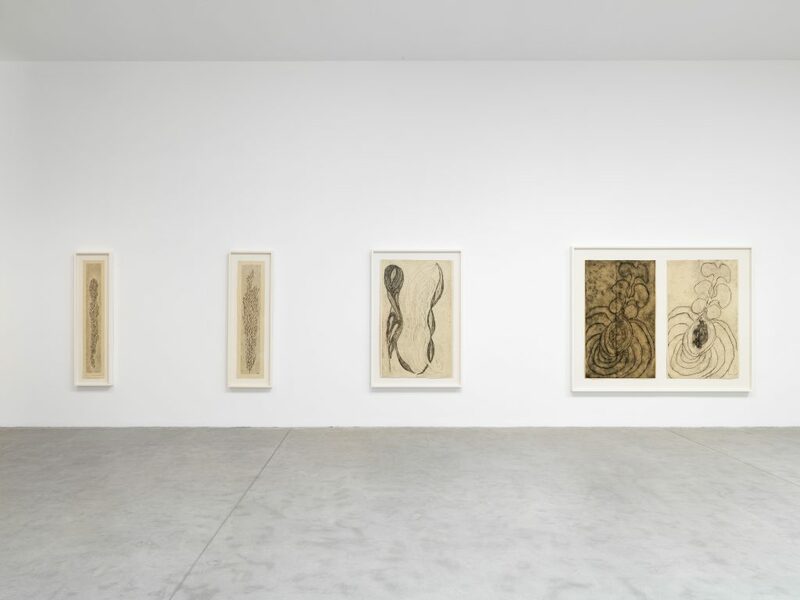 These etchings, extraordinarily large in scale, capture the strength and intimacy of the artist’s hand as she drew directly on the copper plates. 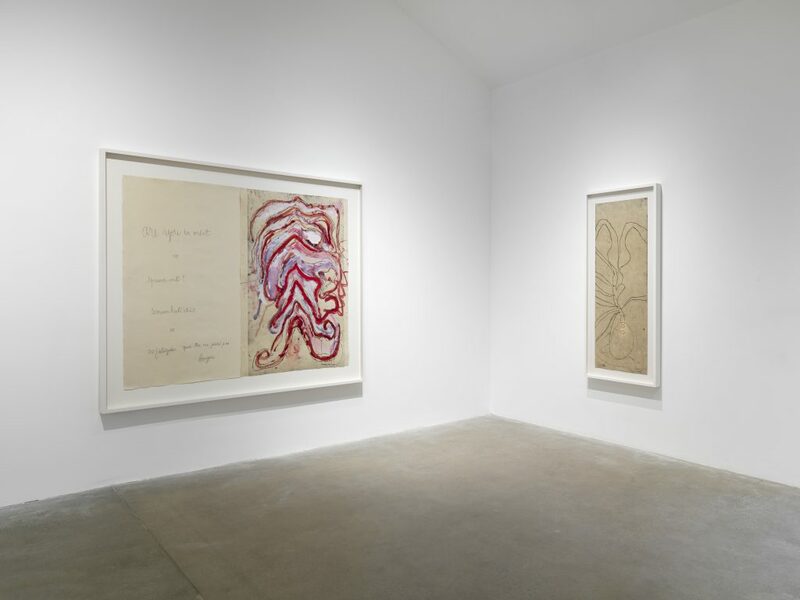 Both figurative and abstract, these compositions form a collection of highly personal memories and ideas, interweaving the artist’s reflections on femininity, sexuality, botany, family and infancy. Placed in dialogue with a selection of sculptures by Bourgeois from 1970 to 2005, this innovative sequence sheds new light on the late practice of one of the most influential artists of the 20th and 21st centuries. The works on display in the exhibition reflect the complexity of Bourgeois’s practice. They articulate recurrent motifs drawn from her memories – memories she treasured and was traumatised by in equal measure. By turning her attention inward, Bourgeois processed her experiences and emotions to form the fabric of a diverse and remarkable oeuvre. The theme of motherhood features prominently throughout Bourgeois’s work. Her own mother, whom she greatly admired, died at an early age; her loss is felt keenly throughout the artist’s body of work. 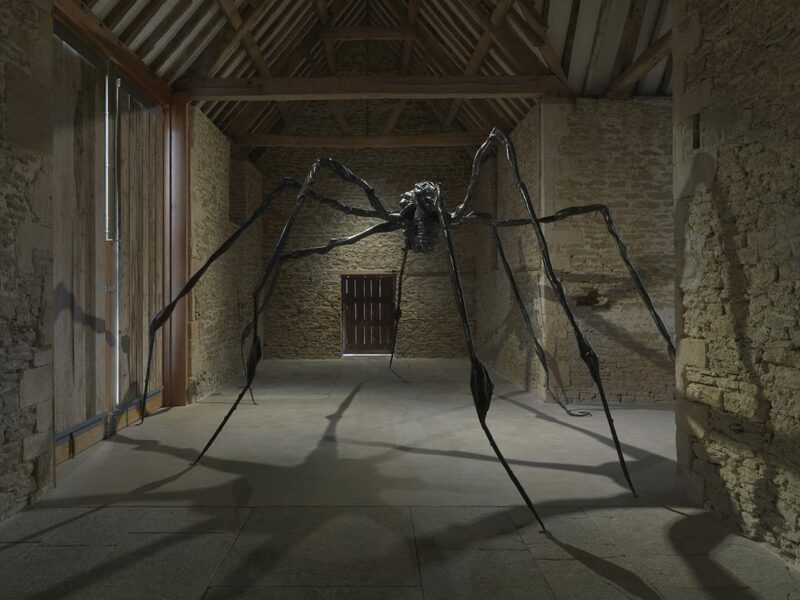 Entering the first of the gallery spaces, the viewer is confronted by a giant bronze spider. The spider’s legs engulf the darkened space, reflecting formal and thematic dichotomies – the arachnid form is at once the maternal predator and protector. From within its web the first of the series of etchings emerge. ‘The Nest’ (2009), a thread-like composition, dense and complex, depicts the entangled thread of the spider’s allure, suggesting a retreat or safe haven, rather than a predator awaiting its prey. This ‘home’ is analogous with the threads that inextricably intertwined Bourgeois’s childhood with her parents’ tapestry restoration business, which was focused on conservation and repair. 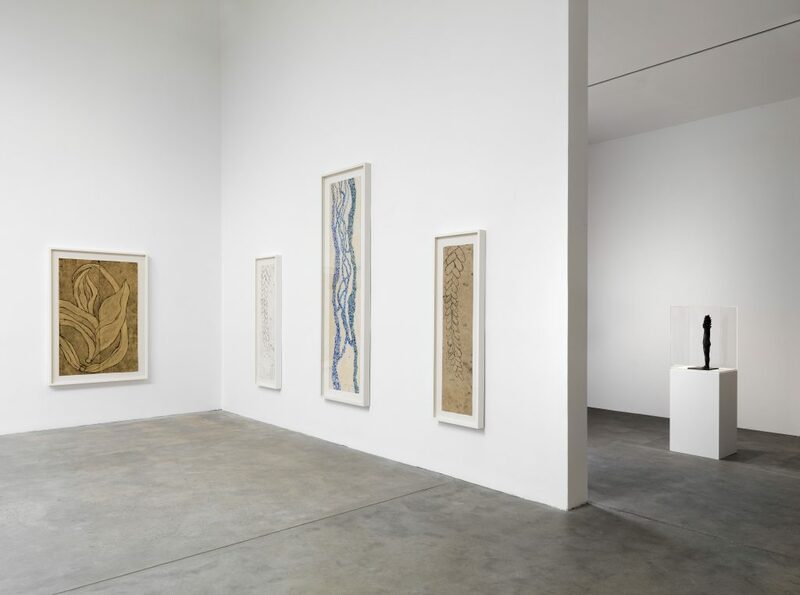 In the ensuing galleries, a sense of openness and calm takes over. For Bourgeois, repetition provided a mechanism to counteract the turbulence of her inner life. In ‘My Secret Life’ (2007) the artist employs a figurative vocabulary drawn from the human body – a totemic column of breasts and phalluses pile up along the central axis of the composition. As she wrote, ‘there has always been sexual suggestiveness in my work. Sometimes I am totally concerned with female shapes – clusters of breasts like clouds – but often I merge the imagery – phallic breasts, male and female, active and passive’¹. Bourgeois lived with four men – her husband and her three sons – and she saw herself as their protector. In ‘My Secret Life’, the phallus is enclosed and supported by the breasts, which surround it. 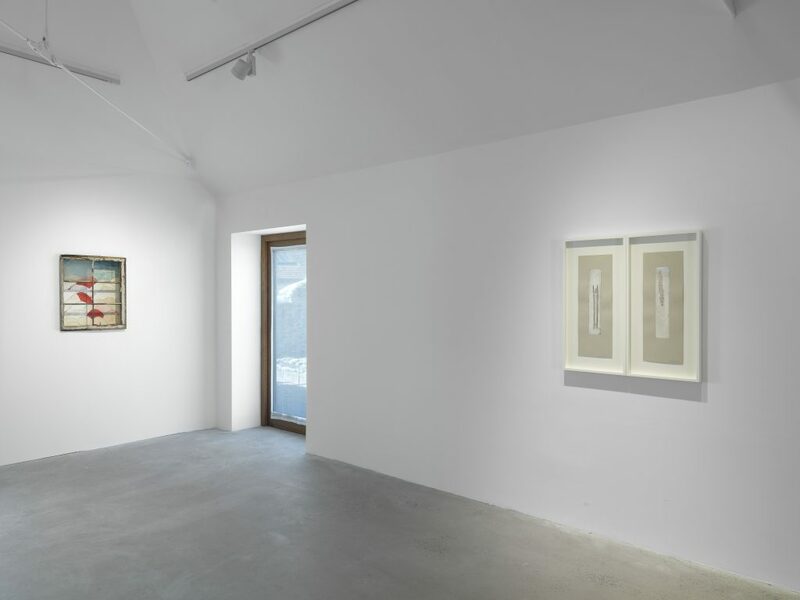 Despite the dichotomous nature of the caretaker theme in her work, it overwhelmingly reflects calm and peace. This is emphasised by the wall sculpture, ‘My Blue Sky’ (1989 – 2003) in which a mountainous landscape dissolves the curves of the feminine body as they float up towards the loosely rendered blue sky – a colour that represented, for Bourgeois, peace, meditation and escape. She loved the New York sky – so blue and clear in contrast to the grey of Paris where she grew up². The window frame in this work was salvaged from the basement of her home. Her sculptural transformation of domestic objects is charged with personal significance. Created in the latter part of her life when she had confined herself to her house, the window represents a lifeline to the outside world. 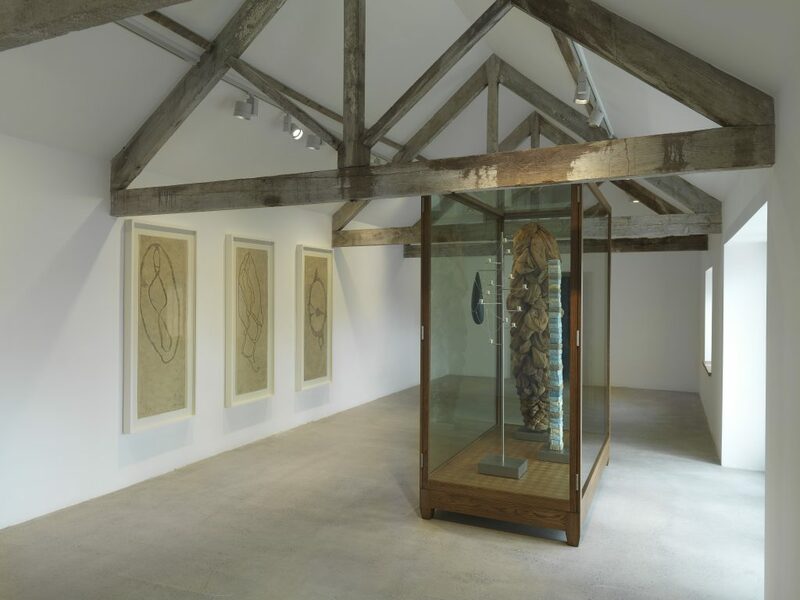 In striking juxtaposition to these works is a trio of totemic structures encased in a glass vitrine. Each column in ‘Untitled’ (2005) is constructed from stacked parts, distinguishable in shape, material and colour. ‘Untitled’ recalls the artist’s distinct Personage sculptures from the late 1940s resembling the postures of human figures and urban structures, such as skyscrapers. The Personages served as physical surrogates for the friends and family Bourgeois had left behind in France, as well as highlighting an interest in architecture that dated back to her childhood. 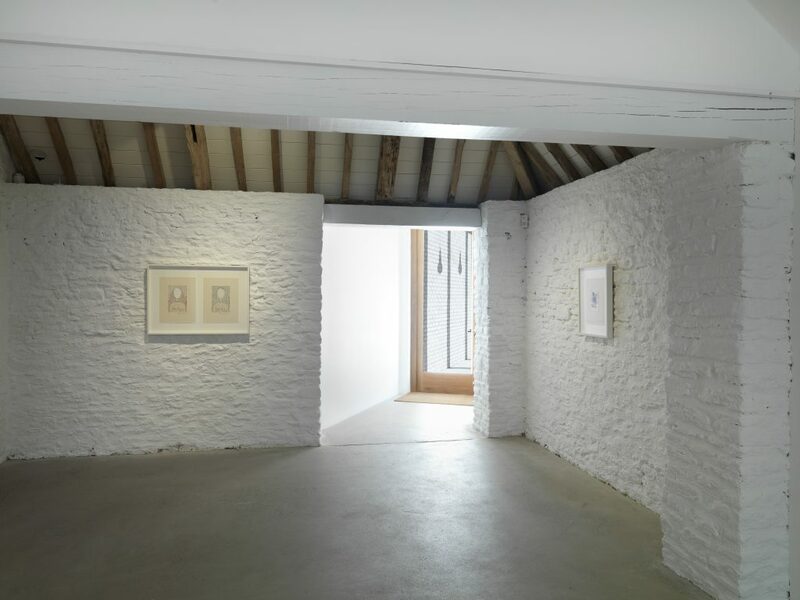 The works on display in the Rhoades gallery, the largest of the exhibition spaces, address Bourgeois’s preoccupation with the natural world. 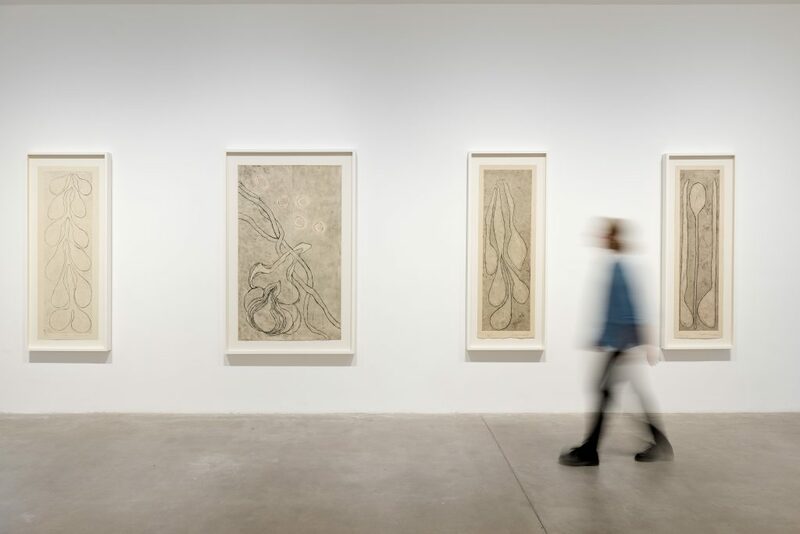 Representations of plants, leaves and botanic forms are seen in works such as ‘The Smell of Eucalyptus (#1)’ (2006) and ‘Les Fleurs’ (2007). 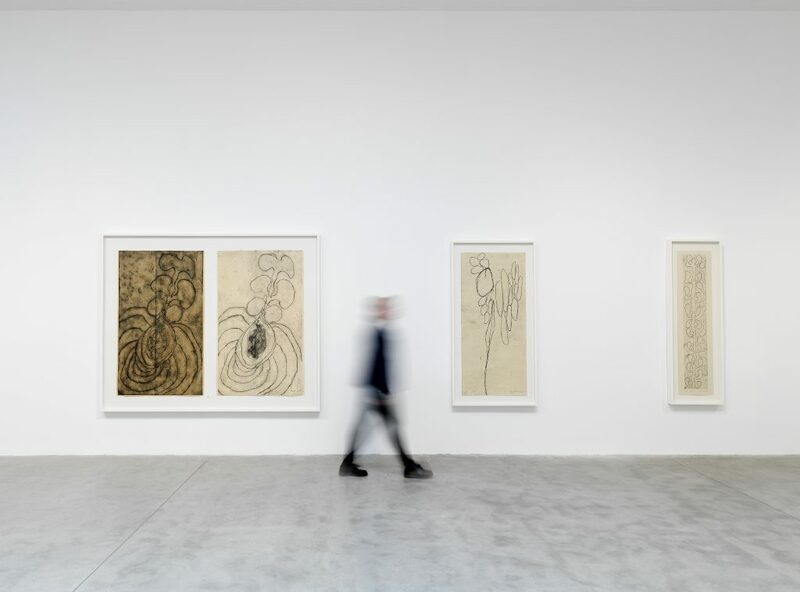 Others are more ambiguous and abstract – the suspended unclassifiable accumulations in ‘The Fall’ (2007); the protuberant biomorphic contours in the diptych ‘Swelling’ (2007) and the gnarled structure in ‘The Unfolding’ (2007). These appear as hybrids of human and organic forms in continuous metamorphosis. 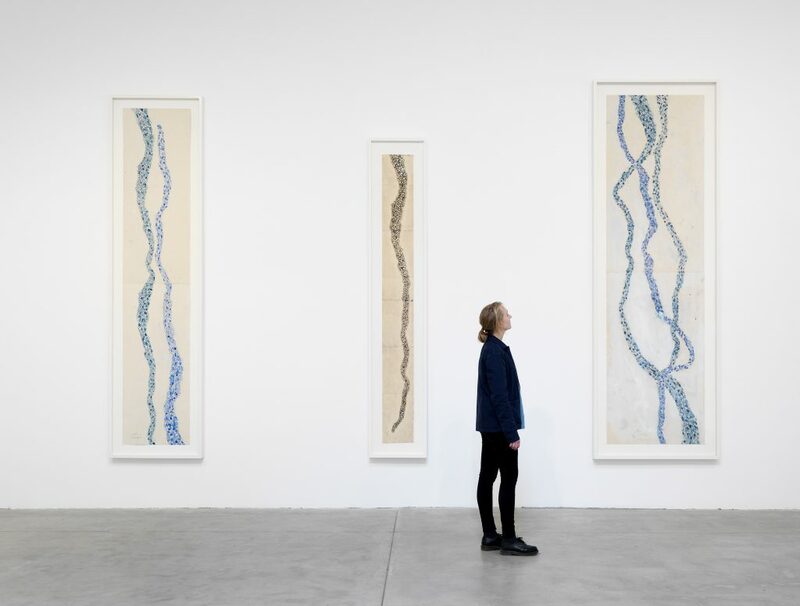 Three blue gouache enhanced etchings, all entitled ‘Look Up!’ (2009 – 2010), depict tangled, vein-like knots running vertiginously up the paper. While these meandering compositions bear resemblance to blood vessels, they also appear as rippling streams in an abstract landscape. 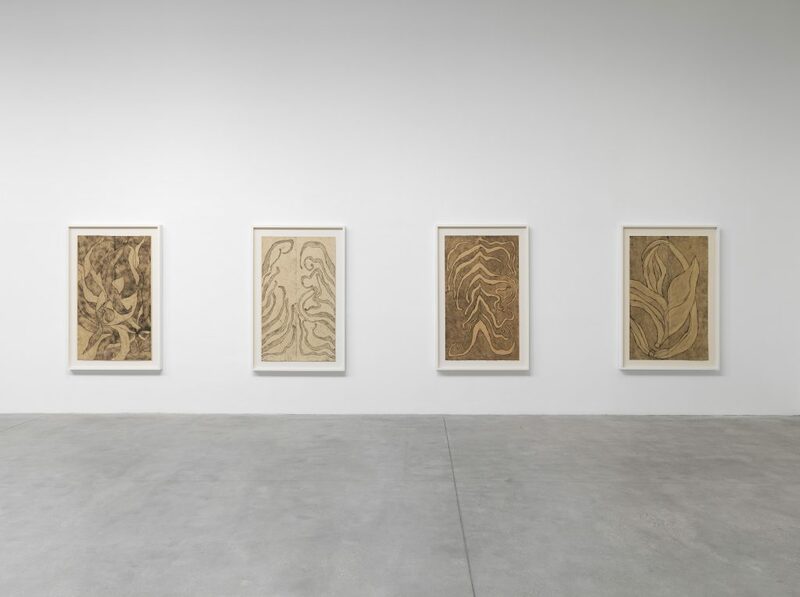 The works highlight Bourgeois’s interest in the relationship between the body and its environment. Nature serves as a powerful metaphor for growth and fertility, a need for peace with the self, with others, and with one’s surroundings. Progressing through the exhibition, passing by the window looking onto Oudolf Field, the visitor sees Bourgeois’s black Zimbabwe granite ‘Eye Benches II’ (1996 – 1997). Meanwhile, in the gallery space, ‘I See You!! !’ (2007) – a surreal etching in which the disembodied outline of a head and torso is filled with an abundance of illustrated eyes – provides a two-dimensional parallel. Together, these works reflect and oppose the onlooker’s gaze, both literally and metaphorically. 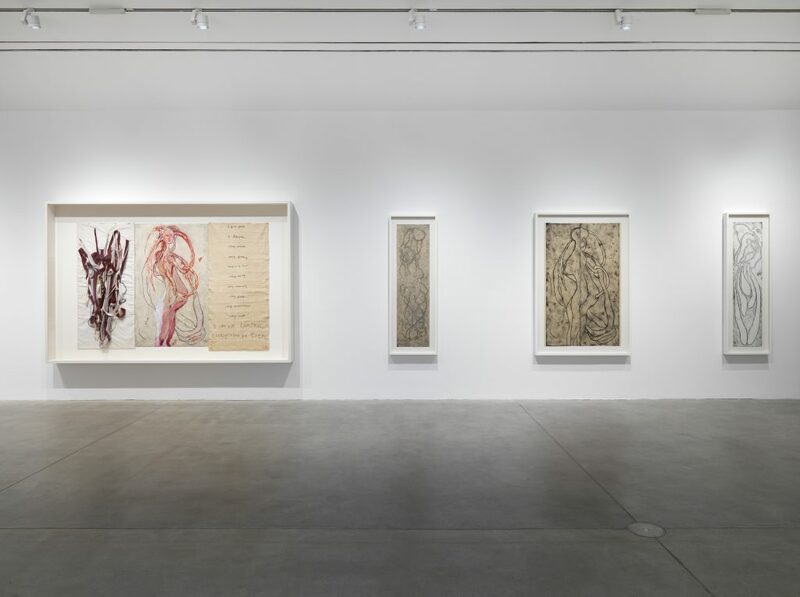 Themes of sexuality, human relationships and the body reach a climax in the final room of the exhibition, where the viewer is presented with a group of etchings emblazoned with emotive words and phrases, revealing the intensity of the artist’s inner turmoil: ‘Red is the colour of blood. Red is the colour of insistence.’³. Bourgeois kept diaries, writing daily for most of her life. For the artist, these highly evocative and poetic documents served the same function as making art, providing a means of harnessing and expressing her emotions. When incorporated within these compositions, her words become striking vignettes of narrative imagery. The titles that Bourgeois attributed to her work paint explicit visual narratives as much as the drawings she produced. ‘The Stretch’ (2006) and ‘Knots’ (2006) both focus on movement, constriction and physical pain. The compositions depict contorted forms resembling fragmented internal body parts. There is a sense of fear and violence. Louise Bourgeois © The Easton Foundation/VAGA, New York/DACS, London 2016.